I love baseball! It truly is America’s pastime. I love everything about baseball – the yummy food at the games, cute guys in uniforms and hats, the excitement of the actual game, and baseball style shirts! This was my casual Friday look last week, the orange is an ode to my team the SF Giants, that celebrate each Friday as Orange Friday! Orange and white baseball style t-shirt $4 Old Navy, bought two weeks ago. What a deal for this shirt, I bought two others in red and green stripes, I was bummed they were out of the hot pink in my size! I like that this shirt has a button on the neckline that you can unbutton without showing too much and then you have a v-neck! I also love the color, it is fun and playful and according to my teenage students it is very trendy, but who cares if it’s trendy or not – not me! 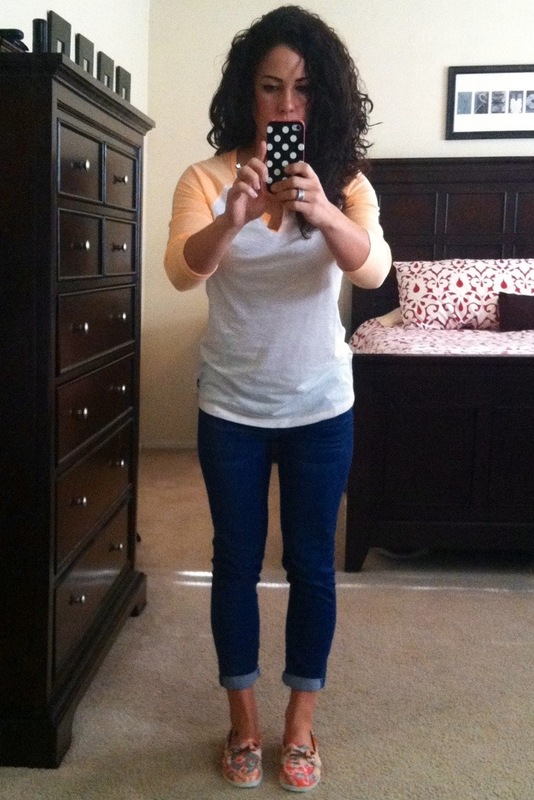 7 For All Mankind Crop and Roll Skinny Jeans bought last spring at Nordstrom Rack, last seen here. These are the best jeans, really I’m not kidding! I admit 7’s are a splurge and not necessarily frugal, but I often find them at Nordstrom Rack, TJ Maxx, Marshall’s, and on eBay at deep discounts. If you know the size and style that fits your body, it is safe to order them online. One of my secret shopping tips, is to go into Nordstrom or Macy’s and try on premium jeans to find the size and style you like, then go online and find them used or from discount retailers such as eBay, Amazon, or Poshmark. I’ve done this many times and have always been happy with my purchases. 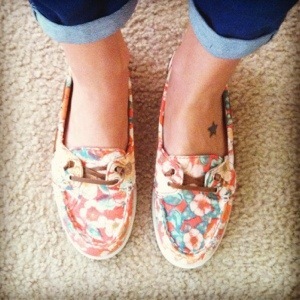 Sperry inspired floral boatshoes $8.99 at Old Navy, bought two weeks ago, I bought a similar pair last seen here. I think these shoes are adorable, but for some reason this pair is not nearly as comfortable as the other pair I bought. I am hoping I can gently break them in, so I can wear them through out the summer. Haha, I’m glad I’m not the only crazy lady tying on 8 pairs of designer jeans @ dept. stores (taking pics of them in the dressing room) in hopes of finding them on wonderfully awesome “Ebay” … Love your shoes and your hair is fantabulous! I’m glad there’s at least two of us! I know I irritate the sales girls when I try on so many jeans and walk out with none! Thanks for your kind words! Thank you! A friend told me they are marked down even more now at Old Navy! Great put up, very informative. I wdnoer why the other experts of this sector do not understand this. You must continue your writing. I am sure, you’ve a great readers’ base already!|What’s Taking place i am new to this, I stumbled upon this I’ve found It positively helpful and it has helped me out loads. I hope to give a contribution & help other users like its aided me. Great job. I’ve always liked baseball shirts. They’re so cute. Thanks so much! I agree and couldn’t pass up the great deal on this top! Thanks! I couldn’t leave them on the rack when I saw they were only $8.99 and in my size!